CMS Window Systems has won a contract to fabricate and install curtain walling and glazing systems for Aberdeen Art Gallery, which is currently undergoing a £30 million redevelopment. 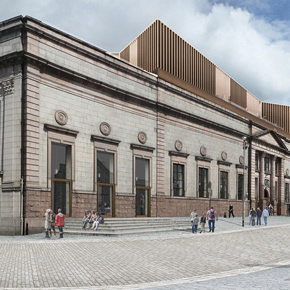 Expected to span two years, the development project will transform Aberdeen’s Art Gallery, Cowdray Hall and Memorial Hall. Designed by Hoskins Architects, the upgrade will create new educational facilities, improve performance spaces and provide 21 new galleries. Working under the project’s primary contractor, McLaughlin & Harvey, CMS will develop and deliver curtain walling. A significant part of the build will involve altering the building envelope and removing the existing skylights and pitched roofs to create a rooftop extension; CMS’s solutions will be used for this part of the development. At its Castlecary-based manufacturing facilities, the company will fabricate approximately 150 square metres of curtain walling, utilising Metal Technology’s System 17 SP (Silicon Pointed). When installed on site, this structural glazing system will add a continuous external glass frontage to the façade. The system will feature 32mm insulating glass units (IGUs), which will incorporate a 6mm PLANITHERM low e glass inner pane and a 6mm SECURIT glass outer skin; a 20mm cavity with warm edge spacer bar will also be included. On the building’s west elevation, the façade will offer additional solar control: a 6mm COOL-LITE SKN 174 inner pane will work to manage solar gain in peak sunshine. The façade will also feature spandrel glazing, created with a 6mm EMALIT ceramic painted inner skin and insulated with 75mm foil faced rigid PIR. CMS is scheduled to begin installing its systems in September.